Peter Pan Syndrome – I Don’t Ever Want To Grow Up! is for eternal boy, used in mythology to designate a child-god who is forever young; psychologically, it is an older man whose emotional life has remained at an adolescent level. The puer typically leads a provisional life, due to the fear of being caught in a situation from which it might not be possible to escape. He covets independence and freedom, chafes at boundaries and limits, and tends to find any restriction intolerable. We’ve all seen them, on our odd, occasional visit to a nightc lub. Guys we saw on the scene 20 years ago. As in the old days, shirts off, steroid-enhanced musculature, obviously on “something”, dancing around with a botoxed, permanent I’m-having-the-time-of-my-life semi assinine grin on their spray tanned faces, making sure everyone is watching them, amyl bottle STILL being screwed into one nostril or the other. They know everyone, from the doorman, to the bartender, to the DJs, and every other individual who lives their life in this nighttime world. Our first reaction is “That’s a bit sad at their age!”, followed by a twinge of guilt that you may, perhaps, be envious of them. But the question lingers…is it just that they can’t let their youth pass them by, and settle into a time of their life that is easier to msintain! As gay men, we have seen these guys around for what seems like forever, and wondered – just when are they going to grow up! These are not – as many inaccurately define them – gay guys who at 45, or 55, or 65, or older, throw som drugs down their throat and have a big night out at the pubs and nightclubs on an impulsive urge. That is just going out for a good time. For these guys, this is serious lifestyle, and one that they can’t give up. Like the recreational drugs that they need to prolong and enhance these nightly nightclubbing rituals…they are addicted to the life. It is not so much living life, as having to compulsively go through the actions, and strive to maintain it, irrespective of the cost. Life does have its stages, and how we live and interact with the world is driven very much by our attitudes, perspectives, and personality. I have an inate fear of turning into what I call “a beige elder” whereby I suddenly throw all dress sense overboard and adopt a singular colour – usually beige- as my uniform of choice. To counteract this, I don’t go out and buy outfits that an 18 year-old would wear. That would be just stupid, and the old “mutton dressed as lamb” commentaries would follow me wherever I went. So, you choose the middle road, whereby you dress well, and fashionably, but keep it appropriate to age. That’s the lesson the Peter Pan brigade haven’t learnt. The need to be seen, to be liked, to be seen as “younger than their years” is a driving force in their lives. It is a psychological need to be seen as young and vibrant, irrespective of anything. It is even a recognised anomalynin other countries – in Japan, for example, Pītā Pan Shindorōmu (ピーターパン♠症候群?, lit. Peter Pan Syndrome). According to a 3007 article in “Science Daily” https://www.sciencedaily.com/releases/2007/05/070501112023.htm overproctective parenting can lead to children developing “Peter Pan Syndrome”. The syndrome is not currently considered a psychopathology, given the World Health Organization has not recognized it as a psychological disorder. However, an increasingly larger number of adults are presenting emotionally immature behaviors in Western society. They are unable to grow up and take on adult responsibilities, and even dress up and enjoy themselves as teenagers when they are over 30 years old. 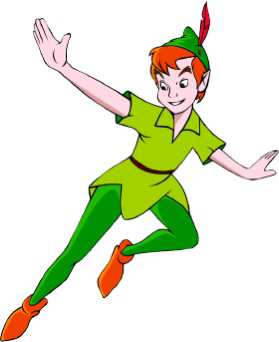 Peter Pan Syndrome can affect both sexes, but it appears more often among men. Some characteristics of the disorder are the inability of individuals to take on responsibilities, to commit themselves or to keep promises, excessive care about the way they look and personal well-being and their lack of self-confidence, even though they don’t seem to show it and actually come across as exactly the opposite. Other causes are:!Link with Narcissism. Peter Pan Syndrome is related to narcissism, but not in the egotistical sense. They tend to be absorbed with imaginative comfort in their minds which attractes them to introspection. This leads them to be imprisoned by childhood fantasy, not the realities and difficulties of life that they need to overcome. Genetics. Peter Pan Syndrome is not a genetically inherited syndrome. It is acquired by: Environmental influences, in which an individual may inhibit it by how they were raised by their parents. Factors such as the so-called “Wendy Syndrome”. (female Peter Pans). To put a gay perspective on it, this article appeared in Gyguts.commin August 2014 http://www.gayguys.com/2014/08/gay-men-curse-peter-pan-syndrome/ and titled “Gay Guys and the Curse of the Peter Pan Syndrome – Gay Men are Great at Everything Except Growing Up” by Dalton Heinrich. “The gay community is great at a lot of things. We are experts at fashion, we are brilliant at design, we are flawless in social networking, and we are professionals when it comes to throwing a party. As a community we thrive under pressure. As a whole we have beaten the odds with almost everything thrown our way. But one thing I have realized in my social note taking is that we are absolutely horrible when it comes to growing up. Since the beginning of my social existence a large portion of my friends had been older than myself. I had always just assumed that I was mature for my age when in actuality I think most of the gay men I associated with had never mentally passed the age of 25. From boyfriends, to just friends, to acquaintances, to people I would repeatedly bump into at gay bars; a large portion of them were at a dead end when it came to maturing. Why is it a social norm of ours to be in our late forties and going clubbing and bar hopping multiple times a week? Of the hundreds of grown men I know, why are so few of them actually grown up? Was I doomed to a life of bottle service and boyfriends half my age because I couldn’t settle down and start a family at an appropriate time? Of all the scary turns my life could take, ending up as one of the middle aged party men cruising the night clubs for a one night stand that concluded with me having breakfast alone and hung-over the next morning, was by far one of the worst. Is it a personal choice each one of us makes or do the majority of us just have no role model to push us in the right direction? As a young gay man whom does not have a single parental figure to aspire to be, I only have the wisdom of the adults around me to sway my decisions. Why are there so few gay men in my life that look at the next generation as someone to mentor and coach rather than a new addition to their dating pool? Are Gay Men Cursed with the Peter Pan Syndrome? It is as if all gay men are terrified to grow up. The abundance of thirty and forty something’s that attend nightclubs persistently and dress like they are going to a college frat party is astounding. Instead of the Botox, barhopping and H&M wardrobes; why as a culture, are the majority of us not having children and planning our futures. This portion of grown men clinging to the wild nights and serial dating of their twenties seem to live in a secret Neverland. It is this category of men that I have personally diagnosed with Peter Pan Syndrome. These Lost Boys that are terrified of actually looking their age and are always fighting off time instead of aging gracefully and being something helpful for the young gay man to idolize? Is it because so many gay men were robbed of a gay adolescence that they seem to never leave it once they are able to experience the youth they missed out on? The sad, thirsty man haunting the shadows of 18 and up clubs is slowly killing our culture. When my generation of gays gets older are we going to think that is the normal thing to do with our nights? Are we all destined to be ghosts of our youth, dramatically hunting down a thrill rather than being man enough and brave enough to go toward the light and move on to actually being an adult? I think it is time to fight off this trend of a permanent youth. We all need to realize how to act our age and how to play our part in our community. It is time to be a role model for the next group of young men. It is time to tell Peter Pan that you want to go home and as much as it may not be the funniest thing to do, it is time to grow up. It all sounds very familiar, doesn’t it! Frighteningly so! I would like to start this article off by thanking everyone who took the time to read my last piece Gay Guys and the Curse of the Peter Pan Syndrome, whether you agreed or disagreed. Knowing that so many people have seen my work is a huge and unexpected experience. I now would like to address the reactions I have gotten to my writing. Queerty and Instinct magazine are a couple of the main sites that have posted articles calling me ageist and telling everyone that I believe ‘Men over 30/Men over 40, should not be allowed in gay bars’. When I read that I was fairly disappointed that such established and respected websites would have to resort to name calling and lying to create controversy. I never once in my entire article suggest that men of any age should refrain from going to bars or clubs; the focus of my article was how the men out at clubs acted. If I am to be expected to respect my elders, than I expect my elders to stop acting like my peers. My article was an opinion piece on lack of role models in the nightlife scene that I personally am a part of, not the entire gay world. Granted, the clubbing and bar setting is not the best place to seek out a role model, but my piece was based off the point that for a lot of younger guys it is their only outing to see older gay men before going back home to a very limited gay environment. It was an opinion piece based off personal experience. I understand if my harsh opinion hit close to home or if my few admittedly general statements pissed people off but both the articles that were about me only seemed to copy and paste my article and throw a few unimaginative lies in for color. The definition of ageist is a tendency to regard older persons as debilitated, unworthy of attention, or unsuitable for employment. The closest characteristic I have to being deemed an ageist is my belief that men and women over the age of 70 should not be allowed to drive during rush hour for obvious traffic and safety reasons. As a young gay man I absolutely respect and pay homage to my elders. I know the struggles and strength they have had to endure to make it possible for my generation of gays to be proudly gay and part of a community at all. The point of my article was not to alienate, attack, or insult men over any age and I honestly don’t think it came off that way. My opinion was merely focused on addressing the lack of social responsibility and good examples that I personally am subjected to along with other gay men my age in my community. I know that whom I surround myself with is my choice and not a representative of the entire worlds gay population. My article was not attacking any age of person; my article was displaying my disdain for the attitude of a portion of them. I stand by my opinion that in the nightlife scene the way a large amount of gay ‘adults’ act is a sad reflection of a culture. I know there are people who make a living off of the nightlife scene and there are successful and mature people who frequent it. There are bar owners, promoters, drag performers, bartenders, event hosts, and much more and I will absolutely admit that my post was NOT referring to them. It was referring to the men who make partying a priority in a desperate attempt to cling to a fraction of their youth and the men that portray immature social attitudes. I have received an abundance of hate messages and personal insults via twitter and comments on my article from men all over the world. So many of these men were calling me stupid, ugly, badly dressed, and a handful of other petty insults. One of my personal favorites was a guy attacking the color of my roots. Ooh, you sure showed me buddy, kudos to you. Of all the people who disagreed with me, not a single one of them reached out to me trying to show I was wrong with valid points, a calm reaction, an educated lecture, or even a rational attempt to clarify that I was mistaken. Instead, insecure grown men called me names, harassed me, and wished bad things upon me as if they were 13-year-old girls starring in a Lifetime original. If anything, this onslaught of middle aged cyber bullies only proved my point. There is no better way to judge someone’s maturity than to see the reaction they have to being called immature. I find it sad that these men more than twice my age who no doubt are extremely well educated and hold wisdom that I could definitely benefit from chose to attack my appearance and throw insults my way rather than guide me back from the mistake they clearly think I have made. I have no problem with men of any age going to bars or clubs whenever they feel like it. I have no problem with large age gaps in gay relationships, since the majority of men I have dated were well over 30 I think my opinion on that is obvious. I don’t see any issue with men of any age group dancing on tables and enjoying life however they want. I not only support older men in bars, I endorse it. Most of you have had to fight like hell to be free enough to do any of that. My issue only lies with the fact that the younger generations of gay men who will one day be the adults in our community are watching you. We are looking at you and we are seeing your behavior toward one another and toward us. You are in a sense our teachers and parents. Some of you may have not wanted the responsibility of having kids but it’s too late for that. Congratulations, it’s a boy! You are our teachers, you are our coaches, and you are our fathers. How you react to conflict is recognized, how you deal with issues is important, and what you do with your life is valuable. The widespread, international reaction I have gotten shows that I have blatantly offended a large amount of people with my observations. If this many people are upset by the opinion of one person then doesn’t that suggest that there is something deeply wrong on a larger scale? If my article were just some bogus trash thrown onto the Internet by an uneducated kid, would so many people be offended by my words? If I am so off base, why are so many people retaliating on a personal level and if it did not ring even slightly true would it warrant a response at all? Regardless of my opinion and personal beliefs every single one of you is blazing a trail that men my age will follow one day. Every single one of you is holding the steering wheel of our community. I understand you getting upset with me for saying that some of you can’t drive but for Christ’s sake, pay attention to the road. You have kids in the car. Gay men also like to run around with their heads in the sand, and any attemots to create humour, or to point out anomalous aspects of the community are always met with cries of internalised homophobia, or discrimination,mor misinformation. It’s time to face facts guys – we are not a unique species who are exempted from the problems and foibles of the general community. As a small enclaved community, there can be a tendency for conditions such as Peter Pan Syndrome to be more blatant and obvious. Like Dalton, I am not suggesting that guts of any age shouldn’t go out and enjoy themselves and party on in the bars and nightclubs. That us just having fun – it is not the addiction and personality disorder that this article is about. As a gay community, we need to recognise that these conditions exist, and that our very lifestyle actually encourages and exaggerates same. In a community of vibrant, colourful, creative people…the Peter Paners still stick out. Perhaps we need to create a Neverland!